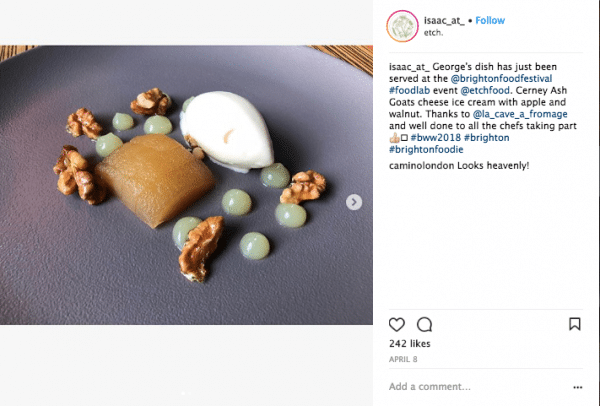 Every restauranteur knows the words ‘there’s no harm in looking…’, its a gateway phrase which will have otherwise resolved diners ordering off the dessert menu in no time. 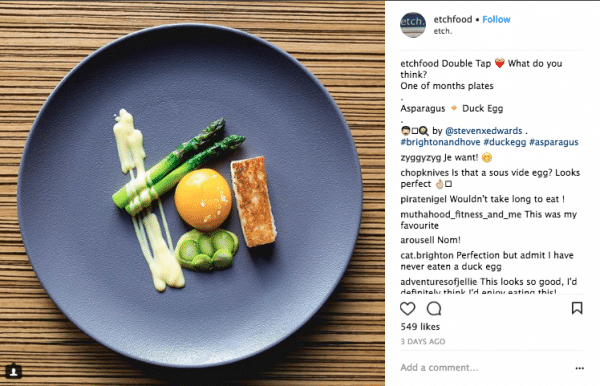 No wonder then there are so many Instagram accounts devoted to food and, for some, it has become an absolute compulsion to hashtag and share before tucking in. 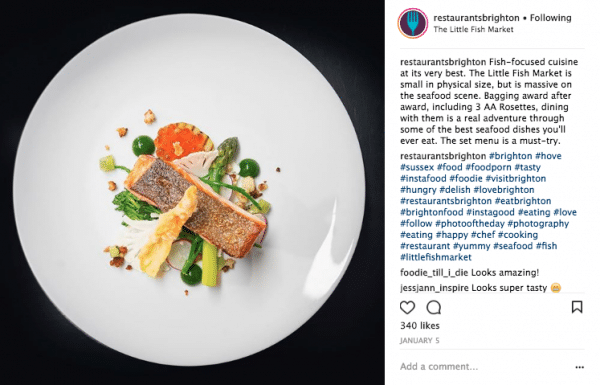 If your looking for something that embodies the campy-kitch joys of the seaside, the Salt Room's 'Taste of the Pier' is it. 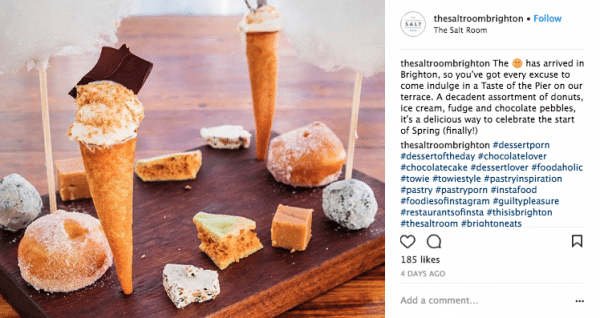 Ice cream, doughnuts, edible pebbles and candy floss, why should kids get all the fun! If Rothko did food it would probably look like this. This is edible art, where simple, seasonal and whole ingredients produce original masterpieces. 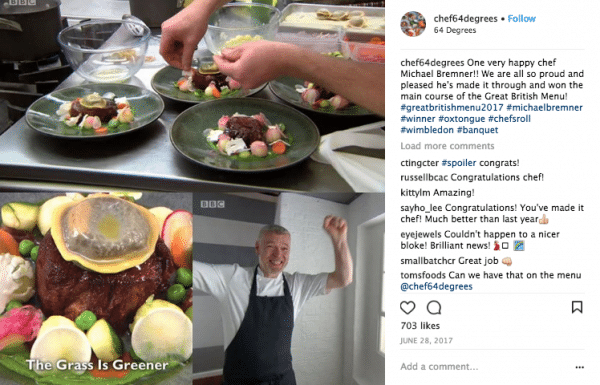 Okay, it may not be the best foodie photo, but Michael Bremner winning Great British Menu with his 'The Grass is Greener' dish had to go in. 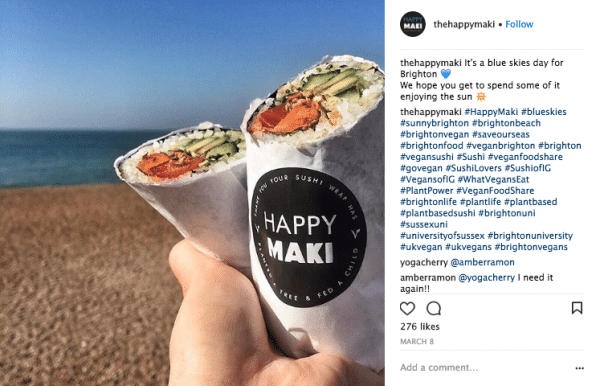 Winner of BRAVO 2018 'Best Instagram', this photo not only shows off the impressive and colourful burrito sized vegan sushi roll but gives us a bit of Brighton looking gorgeous too. Colour, colour, colour! 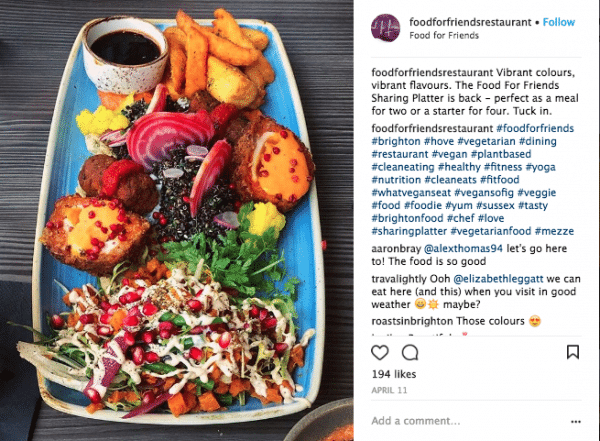 Who ever criticises veggie food for being boring needs their eyes (and mouths) checked. Food for Friends turns out seasonal menus which puts the veg centre stage. 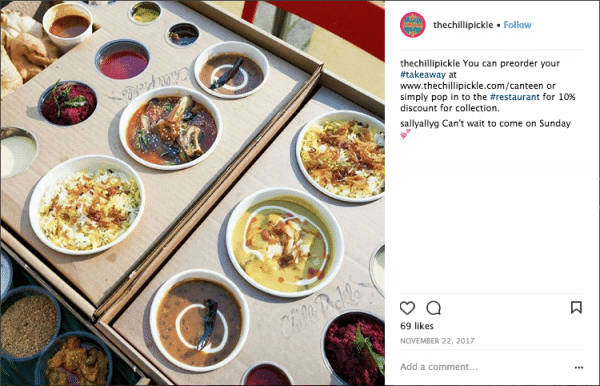 The Chilli Pickle takeaway box is inspired by food served on long distance train journeys through India. Food this pretty is worth staying home for. 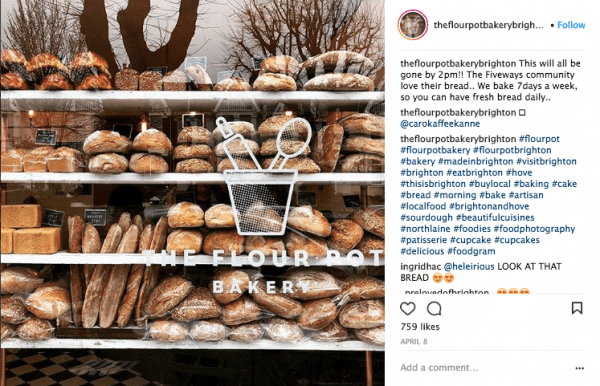 If Flour Pot's photography were in a magazine it would come with a scratch and sniff sampler. We swear if you look at this picture long enough you start to smell soft, warm, freshly baked bread. 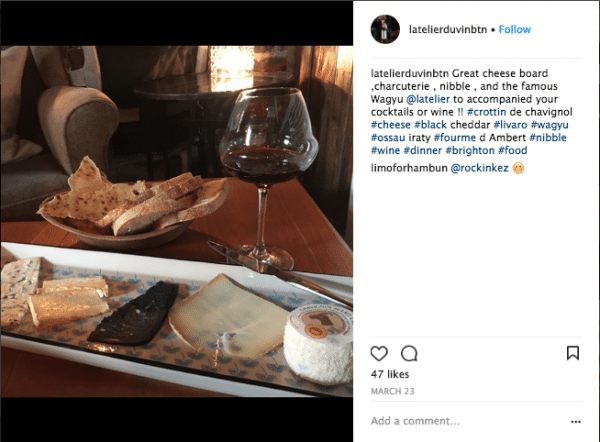 The 1920's inspired L'Atelier du Vin, is a place to cozy up with some stimulating conversation, excellent wine, local cured meat and cheeses. All this pic is missing is a selfie by Ernest Hemingway. This is a bit of Japanese minimalist style or 'wabi' to use the proper term (and who doesn't want wabi with their wasabi?) 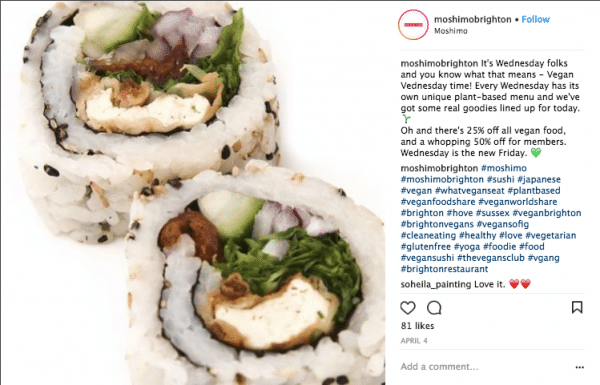 As well as clean photography, Moshimo are strong campaigners for protecting marine ecology and cleaning the ocean, giving this good looking dish some real depth. We call this piece 'Composition in red', warm wine tones, succulent steak pink and a fruity tomato finish. Sure it's all been done before, but has it been done this well? Popping off the screen with a real burst of colour and Latin Fever. These poke bowls really do know how to get your attention. 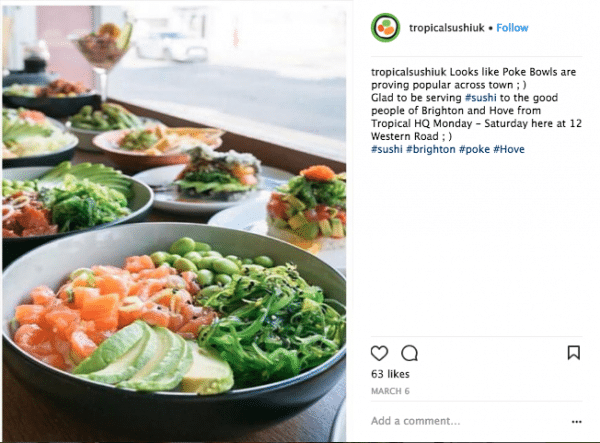 Tropical Sushi won Best Budget Bites in the BRAVO 2018 awards, proving you don't need money to look good. 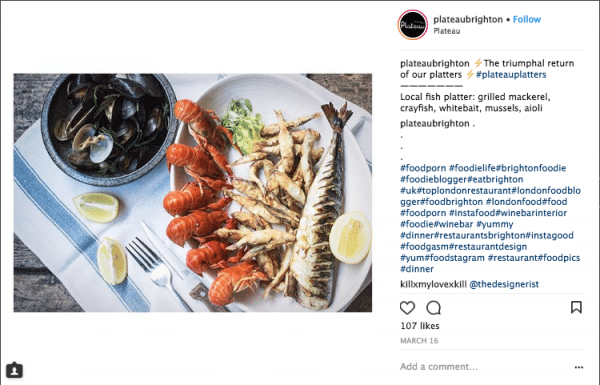 You can take Plateau out of France but you can't take France our of Plateau. This is a locally caught #PlateauPlatter, that looks like it should be in Provence. Squint and this could be seaweed and pebbles, and you wouldn't too far from the truth (geographically speaking). 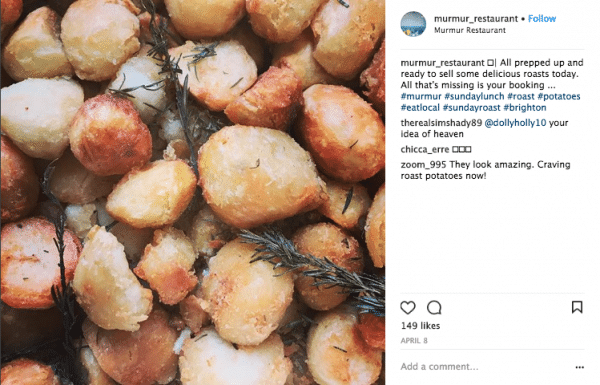 Murmur, on the Brighton seafront, has every right to show off their perfect roasties. Definitely worth a double tap, and then get down to Isaac At on the double. Very season dependent the menu is ever changing, so its a good thing a photo lasts a lifetime. Another great one for self-confident style. 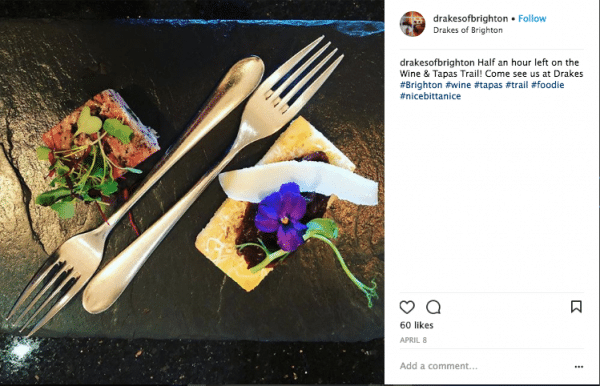 The Restaurant at Drakes has been around a while now bringing us age and beauty. We're sure this dish from etch is going to be engraved on your mind. It almost looks too good to eat, thankfully with etch you know that's not going to be true.